Until the 18th century, Charolais oxes were only grown for local consumption i.e. around the village of Charoles, in Sâone et Loire (southern Burgundy). At the 1867 World Fair, Charolais meat was declared “best butcher’s meat” and after that it was exported all over the world and became synonymous with quality. In 1974 it received the first “label rouge” (red label is the French label of high quality) granted to beef meat. Farming regulations are very strict in order for the meat to obtain these high taste and nutritive qualities : free range and “mother reared”. Naturally, the locals are very proud of their beef and it’s a staple of some of the best-loved classic regional dishes. 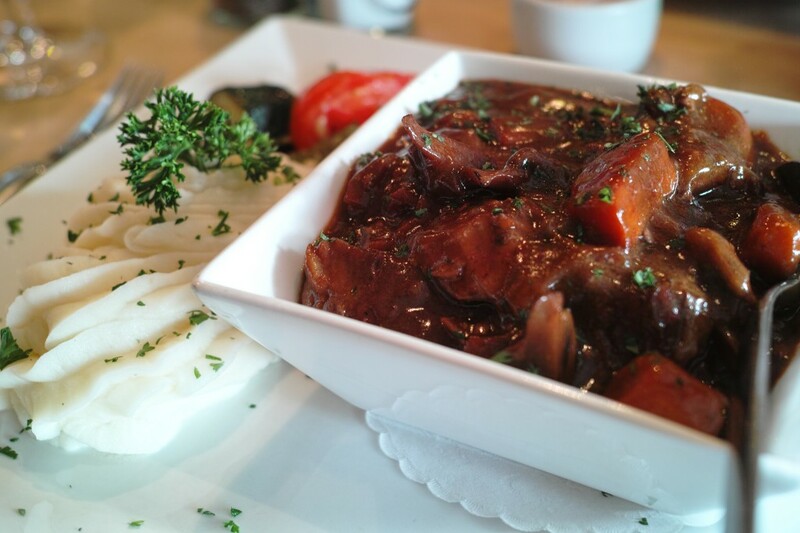 So for a taste of Burgundy, why not try a Boeuf Bourguignon? 1 litre of marinade (made with a carrot, 2 onions, a branch of celery, 15 cl olive oil, 15 cl wine vinegar, a bouquet garni made with thyme, a bay leaf and parsley, 12 pepper grains and of course a litre of red Burgundy wine, Coulanges la Vineuse is an excellent choice!. Three hours before cooking, prepare the marinade and add the meet cut, into 4 cm cubes. After 3 hours strain the meet and keep the marinade. Put the olive oil with the 30g of butter into a large casserole and brown the meet, then add the flour and stir. Add the marinade (with its ingredients) and the tomato puree. Stir again and bring slowly to the boil. Cover the casserole and simmer for 2 hours. Cut the smoked bacon into small pieces and peel the onions. Put the pieces of bacon and the onions into boiling water for 2 minutes. Then strain and keep them. Put the rest of the butter into a saucepan. Brown the onions and then add the bacon and let simmer for 5 minutes. Put this mixture in the casserole with the simmering meat and wait 15 minutes. Present in a large dish, with potato puree or with fresh pasta. What to drink with burgundy beef? Red wine, of course, the same one you used for the marinade!